The Jarvis Street Revue was formed in Thunder Bay, Ontario, Canada in the late 60’s around the talents of, Tom Cruickshank, Wayne Faulconer, Tom Horricks and George Stevenson. 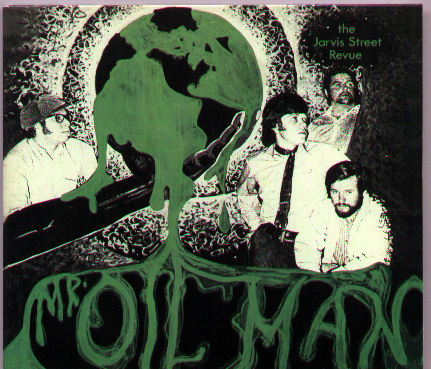 In 1970 the band released their only album, Mr. Oil Manwhich was recorded at DMG Sound Studios in Thunder Bay. The subject content of Mr. Oil Man, is an environmental statement on the use and abuse of the oil reserves, the depletion of Earth’s natural resources and hazards of smoking. Sound familiar? These issues are a concern in the 21st century and this album was 30 years ahead of its time for the bands green concerns and anti-business reflection in the song lyrics of the album. The songs contained on this album fit well in today’s environmentally conscious society. The music on Mr Oil Man, is predominantly heavy rock with psychedelic overtones and a strong Jimi Hendrix influence in the guitar pieces. Originally released on Columbia Records in Canada only, this album has all but disappeared over the years and original pressings of the album have become a highly collectable item changing hands for high prices in collectors circles. The album has also been bootlegged in both vinyl and CD format in Europe. This reissue of the original Columbia Records album by Pacemaker Records in association with the U.S. reissue label Timothy’s Brain, contains the complete album plus seven bonus tracks from a planned second album from The Jarvis Street Revue that was never released. The sound quality on this set is superb and the recording appears to have been taken from the original master tapes. The CD is housed in a beautiful digipack case with original album artwork. Another fine reissue from the catalogue of Canada’s foremost reissue label, Pacemaker Records.